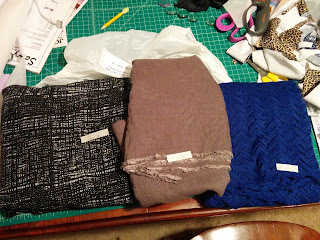 Clothing Hacker: Fabric Mart Pinterest Contest! I love a good challenge. I don't always finish in time for "official" challenges. But guess what?! I squeaked in just under the deadline for this one. 2 3/4 yards of a nice, thick black and white double knit, 1 1/2 yards of a strange gray-brown crinkly poly (I'm guessing, I didn't do a burn test) fabric and 2 yards of a lovely blue chevron lace. 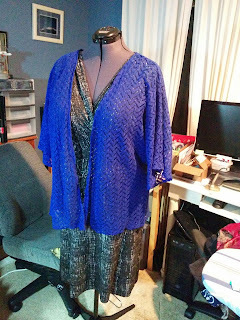 I immediately fell in love with the knit and knew I wanted to try making a Colette Wren out of it. 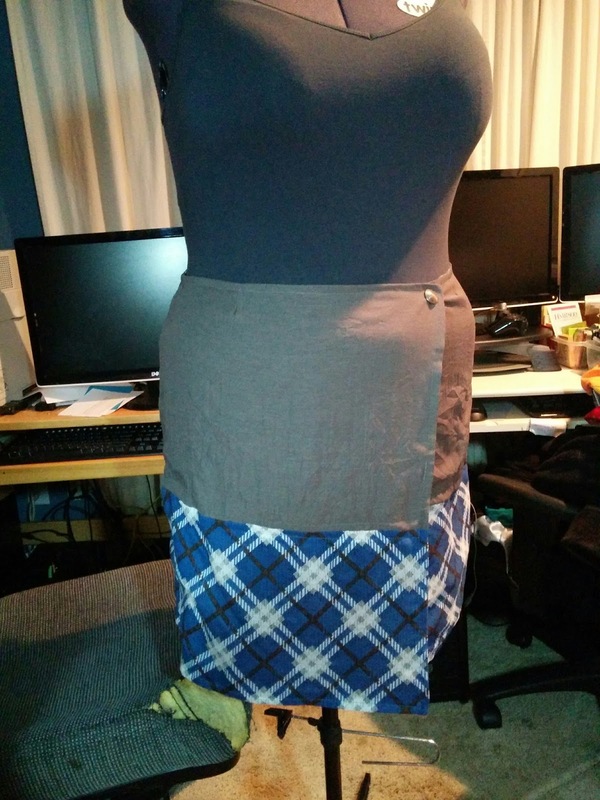 I had already printed and taped the pattern together, so I was ready. 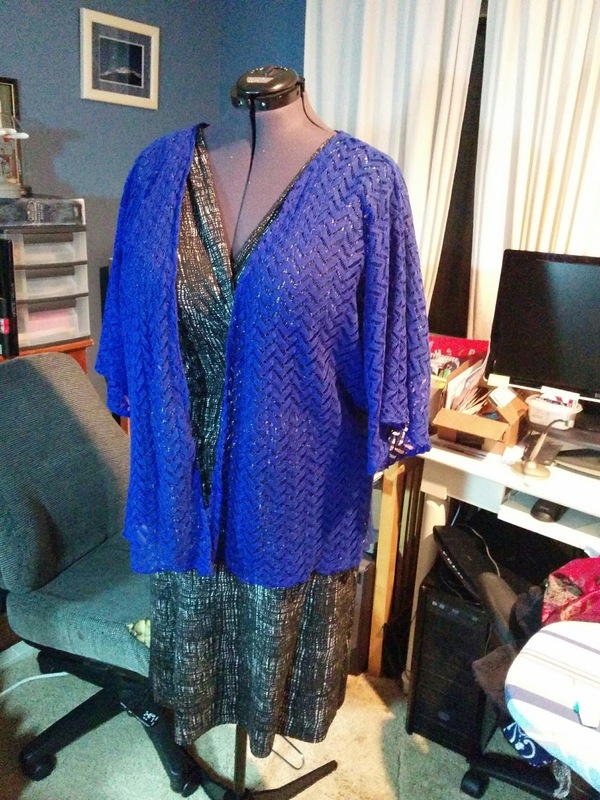 The fabric was a dream to work with and it was 70 in wide, so I even have a nice sized chunk left over. 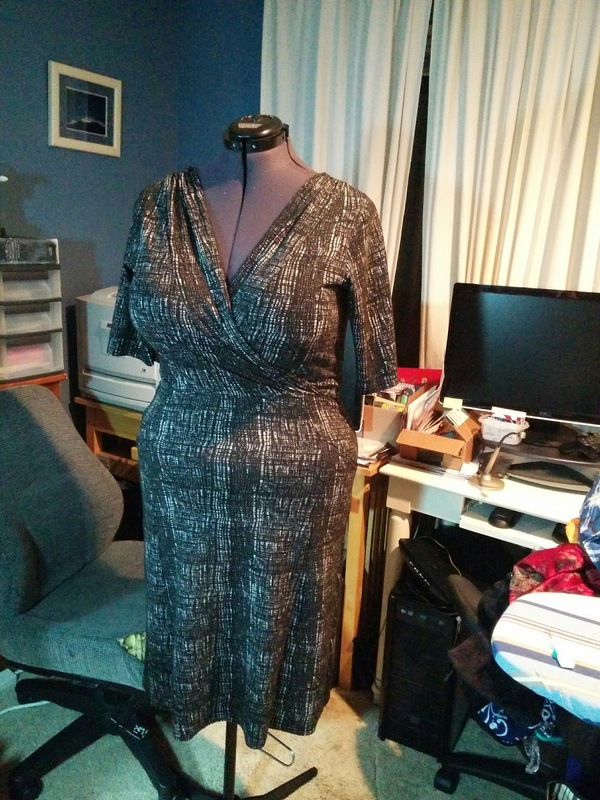 I made a size smaller than I normally would have because I've lost 18 lbs in the last 2 months and I'm planning on continuing to lose, so I wanted something I could wear come fall, since this fabric weight and color are suited more for cooler weather. I can't really tell from that photo, but the dress is very tight right now, but it should be perfect come fall. I also wanted pockets in my dress, but since I was making the slimmer skirt, I didn't think my go to in-seam pocket would work well. So I cut the side front panel to put pockets in. 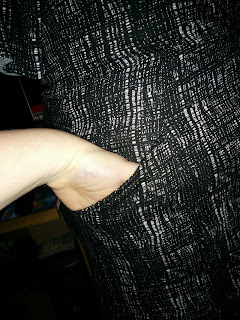 I don't know what you call these kind of pockets, but I drafted them similar to the pockets in my Ottobre dresses. They are plenty deep enough to fit my phone and that makes me happy. Although, I think they are a tad too high to put my hands into comfortably, so next time I'll lower them an inch or two. 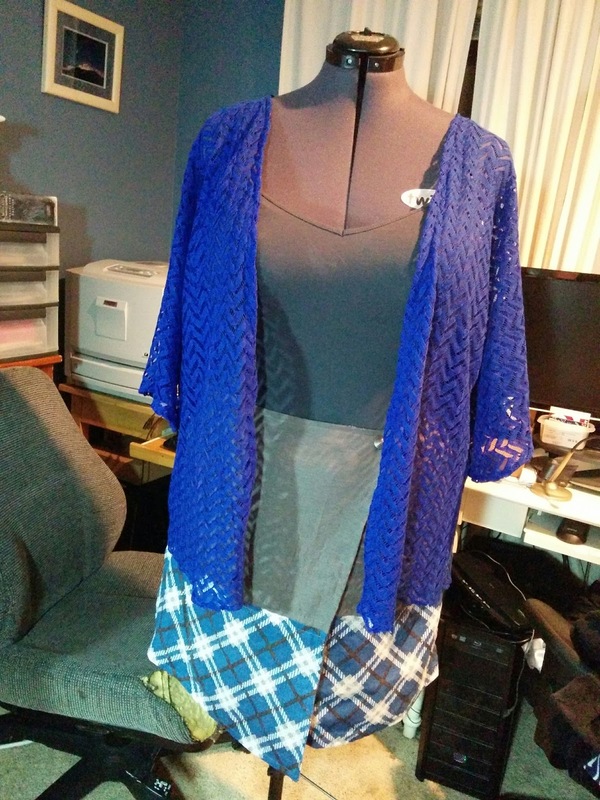 Next, I decided to make a Seamwork Osaka from the gray/brown fabric and pair it with a blue, white and brown plaid cotton lawn I had in my stash. 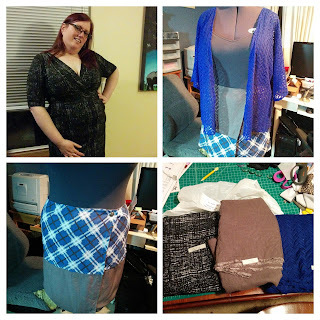 The Osaka is a reverse wrap skirt and you can use 4 different fabrics, but I just used the two and swapped the placement on the reverse. 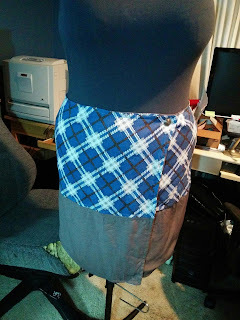 I like the skirt alright, but, again, I made it a size smaller than I actually am. Also that fabric is strange and doesn't press well, but it also doesn't really look like it's meant to be crinkly. I'll likely wear it with the blue plaid on the bottom and a shirt untucked. And last I used the blue chevron lace to make a Patterns For Pirates Summer Kimono. I love how this turned out. I used the selvage edge as the hem and I just turned the edge and used a straight stitch along the front/neckline and the sleeve hem. So, there you have it. My random fabric makes. So, what do you think, do you enjoy the challenge of making something out of a fabric you did not choose? Thanks!! 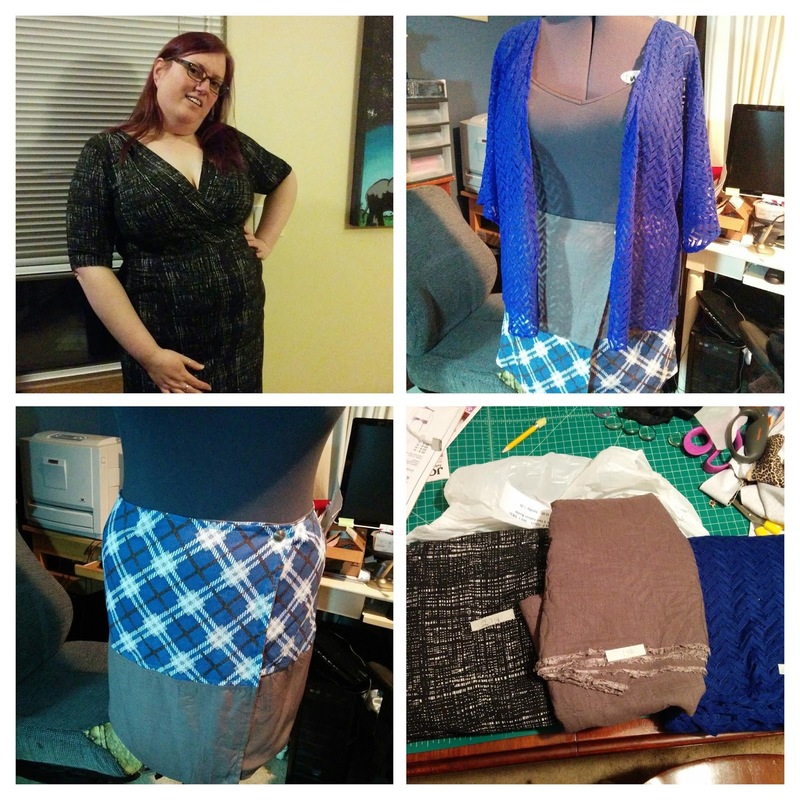 I've had good luck with the Colette and Seamwork so far. My measurements are pretty much exactly their size 20. 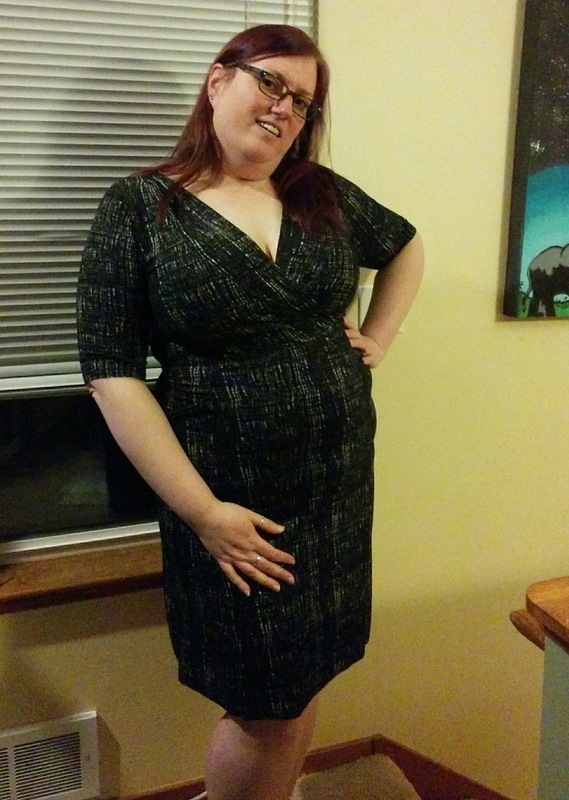 I wear a 40DDD bra and I'm fairly well versed in doing FBAs, but so far I haven't needed to. Although, I haven't made a woven dress or top (other than the Mojave, which is very loose fitting) from them yet, so I'll have to remember to not get too confident and actually make a muslin. No. Sewing is just a hobby.